BUSAN -- This year’s Asia Film Market kicked off to a promising start Saturday, with keen interest from Asian buyers and producers seeking out new stories to turn into films. Some 1,250 participants are attending this year from 45 countries, up 30 percent from last year. Seventy Chinese film executives attended despite dampened Korea-China cultural exchange due to diplomatic disputes over the placement of the US’ Terminal High Altitude Area Defense anti-missile system in Korea, such as Victoria Hon of Beijing’s Hairun Pictures and Dian Song, head of international distribution at Wanda Media. Producers also expressed interest in increased collaborative filmmaking within Asian countries. “There are many diverse genres including thrillers and action. They’re very Korean content, but I believe they will work in the global market as well,” Taiwanese content producer Wenxing Wang said. Various forums will take place until Tuesday. Some nine Korean novels were introduced at the “Book to Film” program Saturday, including Hae Won’s “Sad Tropic,” featuring a North Korean special agent who enters a Columbian drug cartel; Cho Wan-sun’s “Conditions of Murder,” about a series of murders linked to Korea’s political turmoil; and Song Ho-keun’s historical fiction “Ganghwado,” about international conflict surrounding the Japan-Korea Treaty of 1876. BIFF organizers say the rights to two novels have been sold each year for the past three years, and expect similar success this year. On Sunday, eight Koreans writers pitched their film scripts -- the majority of which were thrillers -- at the “Story to Film” program, hosted by the Korea Creative Contents Agency. Korean webtoons from Lezhin Comics were introduced at the “E-IP Market,” a trading zone for intellectual property rights for original content adaptable across multiple media platforms. 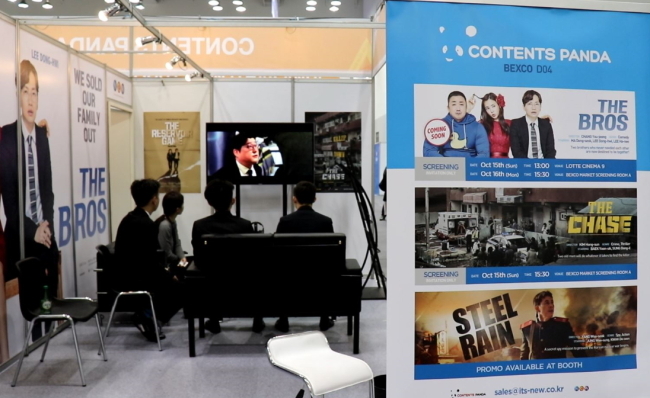 The Asia Film Market takes place at the Busan Exhibition & Convention Center.